I like the new costume, but this look is also pretty rad. Hey, troops. No, not troops. Team. Gang. Fam? It’s been a while. The Doctor has once again landed, this time in Sheffield after a year-long plummet. In the process everything has changed. Not everything, of course. 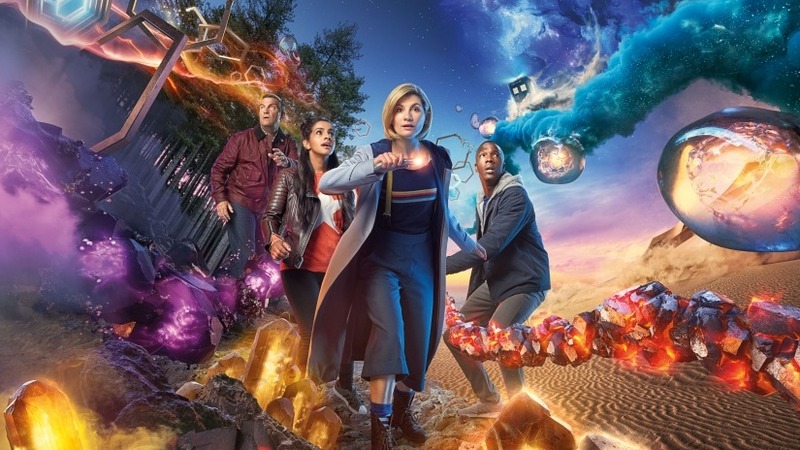 The show is still recognizably Doctor Who, and more specifically New Who, but there are always those subtle differences that define an era, that tell us how a new storyteller (in this case showrunner Chris Chibnall) takes the familiar structure of the premise and character and tailor them to his own concerns. “The Woman Who Fell to Earth” doesn’t represent the most radical break from tradition ever, except in the obvious and laudable casting of Jodie Whittaker, and we do have nine more episodes and a Christmas special to go before we have a complete view of what Chibs is after in this first season. Steven Moffat also played his first season more conservatively, following the lead of his predecessor while seeding in themes and quirks that would come to define his own tenure. But there are some interesting changes of emphasis here that are worth noting. First of all, the Doctor’s Christmas message on the virtue and necessity of kindness survived her fall intact. As far as first episodes go, Whittaker’s Doctor stands apart in her warmth and openhearted kindness. The Ninth Doctor initially eludes Rose’s attempts to attach herself and ask questions, enjoying some playful banter but telling her to forget him. The Tenth Doctor evolves in his comfort with domesticity represented by group hugs and Christmas dinner, but also ruthlessly takes down Harriet Jones on the side. Little Amy Pond certainly finds Eleven immediately lovable, but his twelve-year disappearance uneasily foreshadows some of his innate fickleness and undercuts him as an object of hero-worship. Twelve literally tells Clara that their relationship needs to change, even if he ostensibly takes responsibility for any misunderstandings. And what does Thirteen do? She immediately takes charge, though not in a bullying way. She shares information at an unprecedented rate, though not in a condescending way. She even goes so far as to all but explain regeneration to brand new companions on day one, which is impressively candid. She’s quick in her praise and her gratitude: she thanks Grace for covering the mangled body and apologizes profusely for having not yet solved the crisis. This is a Doctor who loves people and is comfortable enough with herself to openly let them know. All this could make imply that Whittaker’s Doctor is worryingly competent, in the whole “backwards and in high heels” tradition of “strong female characters.” With only one episode in the can, and having listened to several interviews with Chibs and Whittaker, I’m not too concerned at this point. “Perfection is not the aim,” as Whittaker said in the recent New York Comic Con Panel. I expect this Doctor to screw up as much as the next. But it seems equally important to display the Doctor’s best qualities when introducing them and hoping the audience will fall in love with a new incarnation, and Thirteen seems like someone you’d want to follow as she runs toward the aliens. She’s also delightfully funny. The cheerful absent-mindedness works well on Whittaker, especially in scenes like wiping Ryan’s phone, building her new sonic (“should be fine” as it sparks), designating the alien threat Tim Shaw. She’s a confident dork who knows she’s left of center and totally embraces it. Did Lisa Frank design the posters this season? And it’s a good thing that she brings the humor because if there’s one thing that distinguishes this episode from most previous two premiers it’s a certain seriousness of tone. Russell T Davies’ world included bright, vivid soap opera characters and high emotion in both its comedy and its tragedy. Steven Moffat expanded to a playfulness of form, using the very structure of stories to evoke joy, mystery, and wonder. Both, in their own way, incorporated elements of the sitcom. “The Woman Who Fell to Earth” might be the first season premier to feel more like a drama more a comedy. Despite the Lisa Frank aesthetic of the promotional materials, the episode itself is rooted in grounded in a kind of realism, focusing on the everyday lives of people who have struggled: Yaz with her desire to do valuable work; Graham with his cancer; Ryan with his need to prove himself. It’s Ryan we get to know best: his dyspraxia, strained relationship with Graham, disappointment with his father. You get the sense that, for better or worse, much of his life is lived online. I’m sure as things go on we’ll get as many layers to the other companions, but Ryan in particular feels like a character from a primetime soap. Something like This is Us. It’s an intriguing new direction. These aren’t characters who are desperate for escape into adventure in quite the same way that Rose, Donna, Clara and the others have been. These are people who have struggled and suffered, and the Doctor represents a test they didn’t know they were ready for. And their struggles are foregrounded. Grace’s death looms over the episode. If you’ve paid any attention to the media promotion, you probably guessed it early on, maybe even during Ryan’s opening monologue. If you didn’t, it serves as a bold late-episode subversion of expectation. No other new series season has started with a death like this. Sure, plenty have died – killed by plastic dummies or something. But Grace is as much a main character in this first episode as any of the others. If you’ll allow the Buffy reference, she’s the Jesse of series 11. It’s an interesting move from Chibnall, creator of the vastly popular and lauded melodrama Broadchurch, which similarly began with a tragic and unfair death. It declares his intent to go another way, which is really the main thing one wants from a new show runner. The audience is invited into this elegiac mood. We didn’t know Grace well enough to mourn her, perhaps. But we were rather attached to the Doctor’s old incarnation. “We had three glorious years,” Graham imagines Grace saying. He confesses that he “wanted more.” “So did we,” some of us might reply. Like the Doctor, we hang around in the back, not quite comfortable enough yet to intrude on the grief of this family we’ve only just met, but thinking of others we’ve known who are gone. This isn’t to say that elements of tragedy weren’t present in earlier series – that would be absurd. And of course “The Woman Who Fell to Earth” had its moments of levity. But still the balance has shifted. A new writer has seated himself behind the control panel, dialing up some elements while quieting others. It’s the same mix of ingredients as always, of course, but a welcome remix nonetheless. This entry was posted in Reviews, TV and tagged Chris Chibnall, Doctor Who, Science Fiction. Bookmark the permalink.